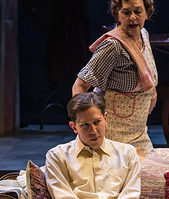 Tennessee Williams' bitter yet shimmering memory play The Glass Menagerie is so very fragile, so dangerously close to self-indulgence and parody. An overindulgent turn by the actor playing delusional matriarch Amanda or Tom, and the playwright's examination of artistry and family turns mawkish and unintentionally comic. No such fate awaits the Menagerie at A Noise Within where Geoff Elliott, the director and frequent ANW player sets a firm course for this journey with four performers guiding the ship with equal finesse. During the company's 1997-98 season, Elliott himself played Tom Wingfield to the Amanda of longtime company member and resident artist Deborah Strang. To the great good fortune of her fans and anybody who missed that production, the actress is back as Amanda, wearing her faded Southern gentility (and her desperation) as comfortably as that outdated dress in which young Amanda would receive her stream of admirers. Fred Kinney's set contains no walls, but still evokes a prison from which only one Wingfield will escape. A series of video projections, designed by Kristin Campbell, plays TV scenes of period-specific domesticity, and serves as a kind of prologue. When Rafael Goldstein's Tom conjures up his past, the video screen holds the portrait of Tom and Laura's father. How telling it is that, years after her husband abandoned the family, Amanda keeps the portrait and suggests to visitors that he will someday return. But that's how our belle rolls &emdash; anything to stave off the madness and despair. Disabled and painfully shy, Laura can retreat into the comfort of her glass animals, but Amanda has no such escape. As Strang's Amanda cheerily peddles her romance magazines to customers on the phone, she is an exemplar of perseverance. Laura's inability to better herself, whether in trade school or in attracting beaux, brings out her mother's steeliness. In preparing Laura for her date, this southern tiger mom jams the falsies down her daughter's top with a businesslike rigor. As it happens, Laura likes how they look. Erika Soto evokes Laura's fragileness, surely, as well as a shyness so painful it is nearly incapacitating (nice touch that Tom keeps a trash can for vomiting purposes near at hand). But with her spectacles removed, her figure enhanced and wearing her prettiest dress, Soto studies herself in the mirror and shows us that there is a beautiful young woman trapped in that mean little apartment with that crazy mother. Goldstein's Tom is equally torn apart, albeit in a different ways than his sister. Deeply resentful of having to work in a warehouse to be the family breadwinner, Tom is perhaps himself a little bit in love with Laura's Gentleman Caller, and definitely struggling with the guilt that he too is looking for an escape. Goldstein gives us the bitterness and his clashes with Strang's Amanda are plenty charged. Tom's introspective dreaminess is less apparent. The production's build-up toward the visit of the Gentleman Caller evokes a spirit of hope for Amanda, for Tom, and for Laura. They may not pay the electric bill, but when a pageant must be staged, these Wingfields can oblige, and the decorative lights that bedeck the fire escape (courtesy of designer Ken Booth) give Kinney's set some serious sparkle. When he finally arrives, Kasey Mahaffy's Jim O'Connor is everything this beacon of optimism is promised to be: confident, kind, proud, full of self-betterment advice and not too handsome to strain the credibility that this man is also stuck in a warehouse job. He and Soto are lovely together, which makes O'Connor's capturing and breaking of Laura's heart that much sadder.